My son turns 22 today. I remember so clearly the day he was born that it is amazing...considering how much I forGET these days! At my current age, my mom already had her first 2 grandchildren and my son is only now preparing to move away from home (at the same age as I did). I am also 9 years older than my mother was when she had a 22 year old child (me) so she was still sharp as a tack. My poor son has had to deal with my feebling old mind since he was 17! (I'm sure he'd say it was longer than that). It is really tough to NOT tell a child the story of his birth day...think of poor Billy Crystal's character in "City Slickers" whose mother called him every year after midnight to recant...once AGAIN...his birth story...geez! Well, I will just enjoy the fact that I still have my darling just-turned-4-years-old nephew with whom I can share childhood with. I visited him and his mommy & daddy for a sugar cookie holiday bake fest this week. I stayed overnight and gosh, it was so much fun watching him roll, cut, and decorate. It was funny because he only wanted the pumpkin cookie shape...and would only DECorate the pumpkin shapes! They turned out messy, pretty, yummy and crumbly...mmmm...nom, nom, nom. In my own home, the three of us just did not feel like going through all the Christmas tree doings so I just strung lights on the stair bannister instead. Some of the best gifts I received at our family celebration were copies of my mom's special recipes, written in her beautiful penmanship, AND her and my dad's wedding bands since Dad has remarried and Mom passed away in 2002. I am so happy that her ring fits on my pinky so I can wear it next to my own wedding band. Man, her ring is a real wide hunk of gold, with minute scratches but no warping. Not bad for 50 years of wear on a 14 karat ring. Nice to have her "with" me daily. 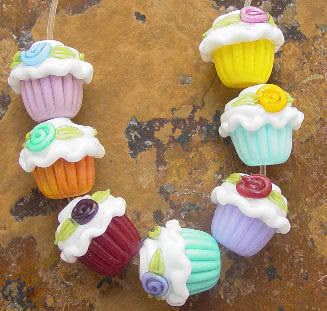 Today is National Cupcake Day, how about that. 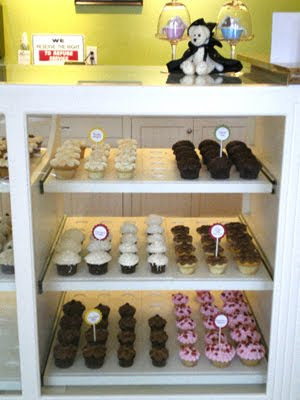 This cupcake case is located at Loves Cupcakes in San Jose, California. You might remember my story I posted about it HERE. I guess you could say my contribution to this auspicious day is continuing my giveaway (details HERE) that runs through all of December. There will be TWO winners!!! 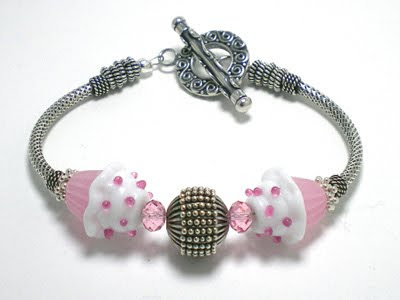 You just have to take a peek at this spectacular bracelet I just completed in soft pink and frosty white colors. Just perfect for all of winter...and year round, really. It's a nice winter addition to lighten things up once in a while from dark colors. You can see more photos and details HERE. 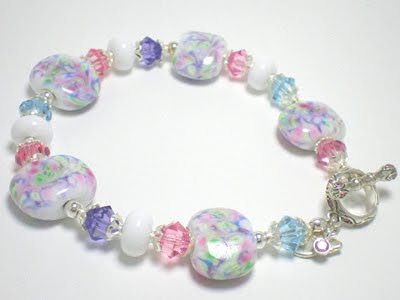 I just love how this bracelet turned out in winter white & pastels. or is for those of you who like extra movement along your arm. BE sure to check out the giveaway HERE! You still have time to get in on my Holiday Giveaway. Check out the previous post for details to win YOUR choice of earrings or pendant...plus, you get a free upgrade to priority shipping for any orders placed. So what do you think of my sweet snow buddies? 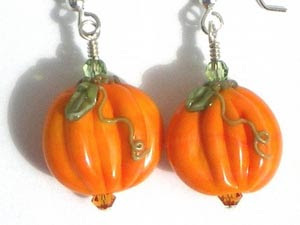 They are so darned cute and in my shop right now. 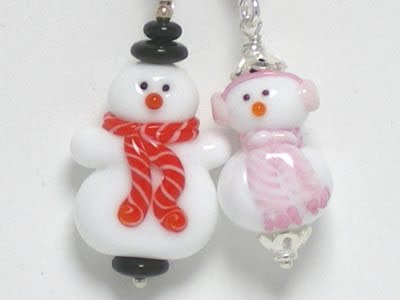 They are sweet little snowment on sterling silver chains and I just love them. I hope you do too. 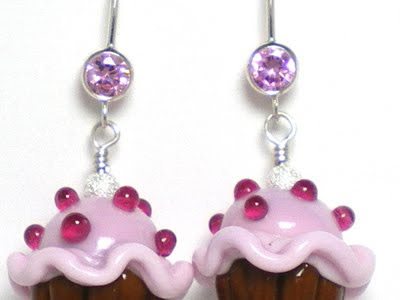 RockerJewlz has a sweet holiday giveaway going on PLUS a special gift for you. The gift is that from today, December 7 through 15, all jewelry orders shipped to U.S. addresses will not only have the usual insurance & delivery confirmation coverage but will receive a complimentary upgrade to priority rate! This means that instead of waiting up to 5 delivery days plus the 3 days for Paypal to clear the bank, you should receive your packages within a week and most likely less…nice surprise, huh? And I will happily ship it directly to your gift recipient if you prefer. And to top that off, for every item purchased in my Etsy shop through December 31st at http://RockerJewlz.etsy.com, you will receive an entry into my holiday giveaway. 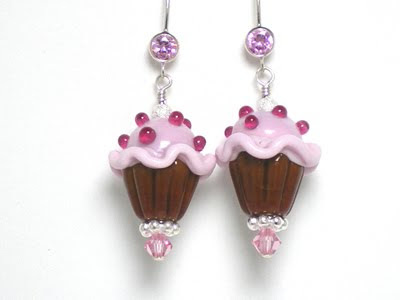 The prize is your choice of any pair of earrings OR pendant available in the shop (not limited to cupcakes this time as in the past)…and TWO of you will be winners, woohoo! Now that is something to celebrate on Sunday, January 3rd, when the winners will be randomly drawn. 1. 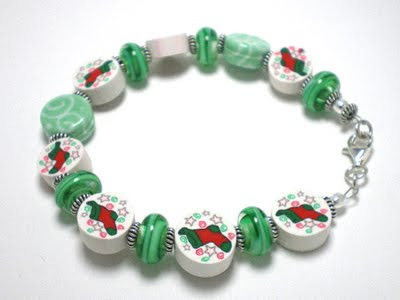 You MUST email me with the url where you announce the RockerJewlz Holiday Giveaway and be sure to include info on how your readers they can find my blog announcement at http://RockerJewlz.blogspot.com. Any public website is fine with me (i.e. your blog, website, Twitter and Facebook) but I have to be able to GO there to see it so be sure to include it. 2. The email MUST include the url, AND your name AND street address (otherwise, how will I mail your prize if you win?). 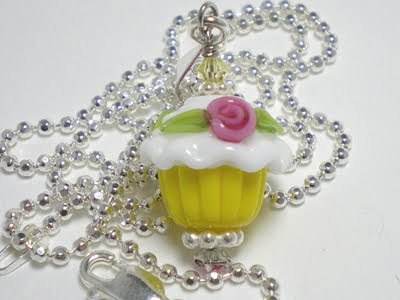 In addition, I now have plenty of cupcakes on 18 or 20 inch sterling silver chains. Not much to say since I'm working on custom orders & a few more Christmas pieces of jewelry. Just wanted to show you my birthday flowers after 5 days...even better than the first day! This vase of flowers from my husband started my Thanksgiving, which was also my birthday (falls on this day every 7 years). The lilies are big and fat and the roses pink & fragrant. He brought these to me with a sweet card and a fresh pot of coffee...ahhhhh. Then we drove up to Napa where my sister was hosting Thanksgiving. The drive is only a little over an hour so that is a treat in itself. We actually ended up with the grouping of family we expected at Christmas, but Thanksgiving turned itself inside out this year. Originally, we were due to visit my in-laws for several days but the entire household became ill and we didn't get a phone call until Tuesday. I thought, wow, so maybe we'll just stay home but we aren't prepared to cook a turkey dinner, and I sure didn't want to spend my birthday doing THAT! So I called Sis and she was SO happy since her regular group of people weren't coming and she was down to her family of 3 plus her father-in-law. As it turns out, my dad & stepmom had to cancel their southern California plans as well, so they were looking for an invite somewhere. We ended up with 9 munchers and Sis was so happy to insert her table's extension to accommodate us all. She and her dad-in-law fixed all the food while her husband smoked a turkey and baked pies. The side dishes were pretty awesome and it was tough to pick a favorite. When I was young, I would demand one entire turkey drumstick which is pretty crazy since we were a family of nine who always had one other family of 6 at the table. But I got it a couple of times. Well, bro-in-law offered the drumstick to me so I happily took it...heehee. It will be interesting to see what happens at Christmas! Did any of you have a quick flip flop of plans for turkey day? I'm wondering if this occurred for a lot of people this year. a year ago and I just got another small handful. Out of 7, I only have 4 left so you've got to move quickly on these. I have the tangerine color listed HERE and the other 2 you see above will be posted tomorrow. If you want one reserved, do it fast and I'll hold onto it for you. Just EMAIL me. They are on an 20 inch sterling chain for only $25. happen upon them right after they were posted, whew! I love them, they are so simple but so pretty. 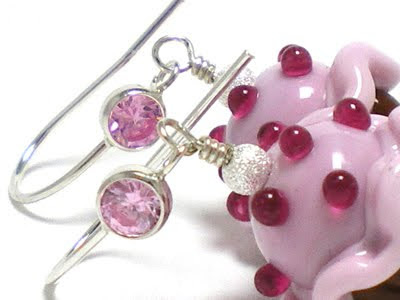 I feel like one of Santa's elves, working in my studio to pump out some beauties for holiday shopping. I should have pretties to show you in the next couple of days so be sure to check back. My 21 year old son got a job he wanted so that he could save up and then afford to move out and live with a couple of his good buddies. It's wonderful and long awaited by him and yes, I'm happy my husband and I will then start what will be our future retirement set up with just the two of us. Of course, if our son has to do what WE both did at one point, move back home to stash some cash, we will welcome him gladly for a temporary stay. But man, these feelings I have about not being needed as a mom....which have been brewing for the past few years, are starting to come close to the surface and I'm thinking, wow, what do I do now? I know, start a fresh journey for me and my husband. For years, I've grasped those wonderful moments of knowing son will be home for dinner that night so it makes cooking it more special. Just him needing me for that one thing gives a boost to my day. So, without that, hmmmm it's going to be very interesting finding how I boost my SELF during the day. Maybe I'll volunteer at the kindergarten classes up the street to get that sweet, unconditional love children have oozing from their pores. I DO know that I'm going to enjoy jewelry design more. I'm one of those artists who need as much peace as possible to work...which isn't very realistic in our noisy world. Just knowing someone can walk in the door at any moment can often keep me from even starting a project. Silly I know, but true nonetheless and I KNOW I'm not alone in that. So that portion of my future I look forward to...long hours of free alone time to let my creative side of the brain blossom. That ought to boost my day! Hi Everyone, sorry about the long space between posts. I'm having a very "blue" week and trying my best to rise up out of it but it's a fight. I know I'll be fine soon, just gotta get over feeling some feelings...grrrrrr. Thanks to the Silver Parrot for your previous acknowledgement. On the flip side, one of my favorite cupcakes is available again....the ones with roses on top! The artist is working less than usual and not taking custom requests, so this is a major score since it's been last year since I had any in this style. 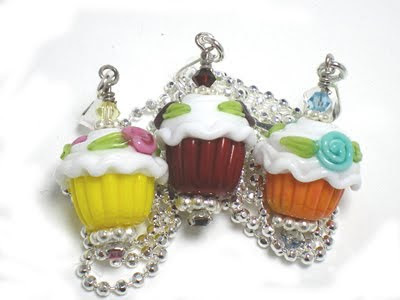 I have one client who is choosing one or two of these and has first call, and I only have these seven cupcakes. Let me know if you want one in a pendant or necklace on an 18 inch sterling silver chain and I'll put you in line for what your heart desires! These are not yet listed anywhere but here, so grab them quickly. I wanted a black & white Halloween this year, but when I was ready to paint the punks, discovered I had no black paint after all. I wanted to get these out on the porch, so I dug out the colors I had...brown, pink and purple. I'll have to plan ahead a little better next time. They still turned out cute nonetheless. in a very long time so my entertainment this year was watching my son get ready for his costume party. He was a video game zombie...eek! I hope you had a good Halloween. Now it's time to get ready for Thanksgiving...sheesh! 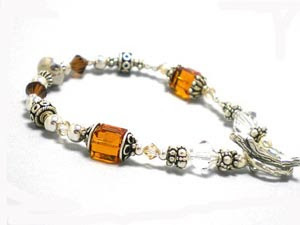 Beginnings Bracelet in Topaz is now available for your Autumn and Holiday needs. I love how the light shines through this particular color of Swarovski crystal. 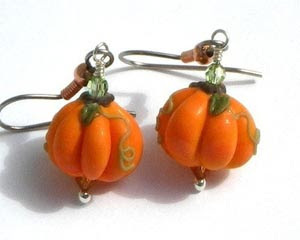 I'm having a nice, big fat sale on Autumn jewelry in my Etsy shop. 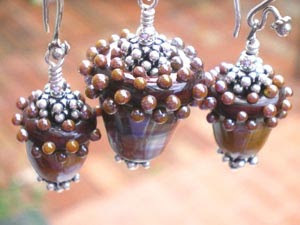 Aren't these glass acorns awesome? They are the colors of candy caramels and oh so pretty. 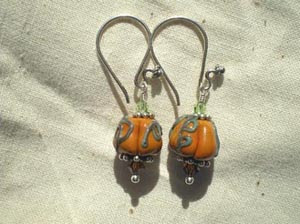 I have plenty of pumpkin jewelry as well. 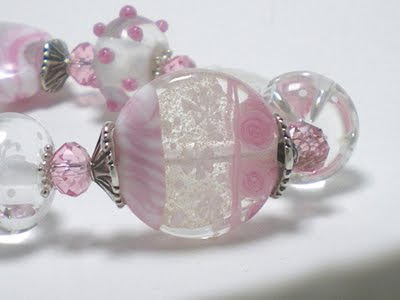 The beads are so pretty that the jewelry turned out quite elegant rather than just another novelty. You'll be very pleased with how pretty they are. So come and enjoy the sale to pump up the volume on your holiday wardrobe! 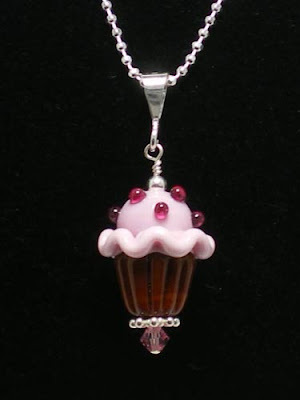 Chocolate Pink Cupcake necklaces are now available! .925 sterling silver ball chain. See if the matching earrings are still available.